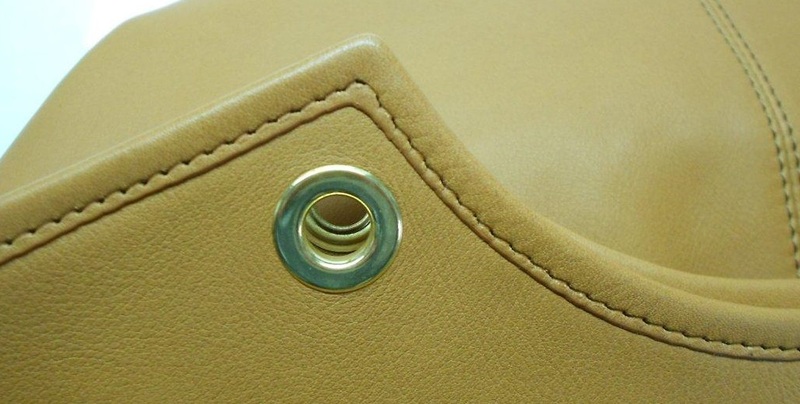 I would like to share our company’s thirty years of experience making luxury leather accessories to help you spot a well made leather article. 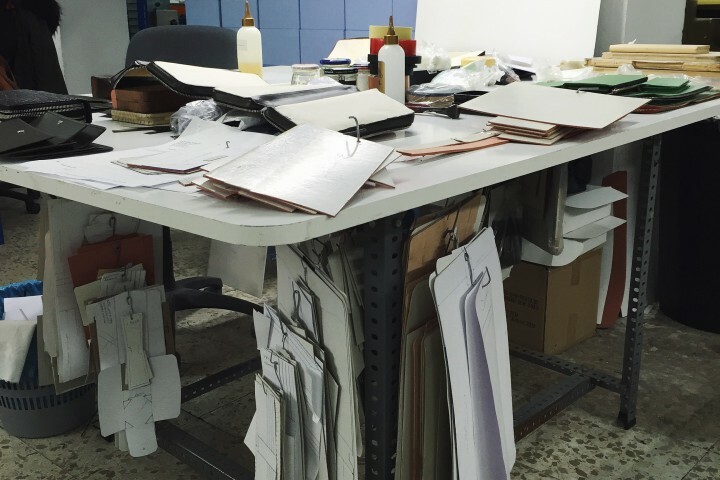 You won’t find this information in any instruction manual and we won’t be able to include every detail in one post, but we’re going to share some of our craftsmen’s know-how with you. After all, life is sharing! 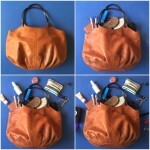 The pictures used here to illustrate the process are taken from our top quality bag, The Talega. You can see how important detail and perfection are to us and how carefully our bags are made. 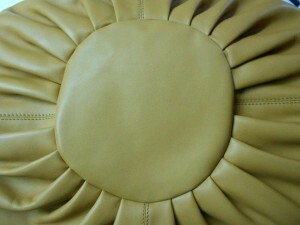 First and most important of all is the leather. 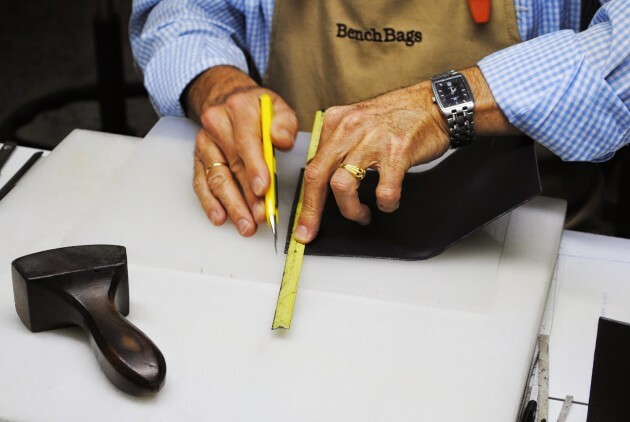 For those of you who are not familiar with leather, don’t worry – there are several more points to help identify a quality bag. The seams are something you can check out easily. On the one hand, the stitching made by a sewing machine must be completely uniform. Each centimeter has to have the same number of stitches. 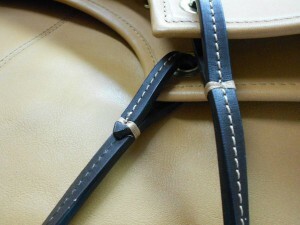 On the other, handmade stitching is usually uneven and makes the article truly genuine. Ya que nuestra empresa se dedica a hacer artículos de piel, veo la necesidad de redactar un artículo que nos ayude a identificar una pieza de piel bien hecha. Esta información no aparece en ningún manual, y seguramente nos dejaremos en el tintero algún detalle, pero vamos a compartir aquí la sabiduría de nuestros artesanos, porque compartir es vivir. 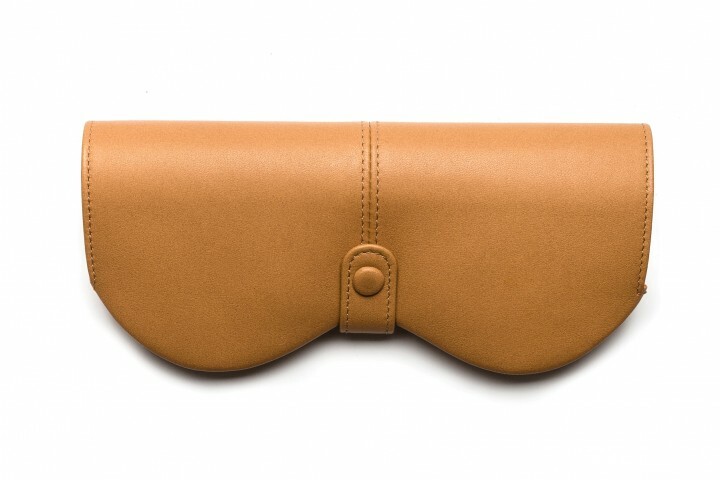 Las fotos que vamos a utilizar para ilustrar este proceso son las de nuestro bolso The Talega, un producto de calidad y queremos desgranar cómo lo hacemos. En primer lugar,algo que para nosotros es crucial es el tacto de la piel. Los que no tengáis muy desarrollado este sentido no os echéis las manos a la cabeza, hay muchos más indicadores. Las costuras son algo fácilmente localizables. Por un lado, las que se han hecho a máquina deben ser completamente uniformes, se pueden contar el mismo número de puntadas en cada centímetro, y por otro lado, las puntadas hechas a mano suelen ser más desiguales, lo que le da autenticidad a la pieza. Combinación de costuras a máquina y pespuntes a mano. In the above photograph you can also appreciate the smoothness of the edges. This is because they have been edge-stained by hand and burnished. The hardware, or metal pieces, used to finish the item should not have any scratches and it’s important they all have the same type of polished surface. En la foto anterior también pueden apreciarse las siguientes características; los bordes son suaves porque han sido pintados a mano y lujados. El herraje, es decir, las piezas metálicas que se añaden para embellecer la pieza, no deben estar rayadas, y un detalle muy importante es que todas las piezas de herraje tengan el mismo brillo. There should be no loose threads, something we have become used to seeing on articles manufactured on a large scale. BenchBags has a very strict quality control system to avoid this type of flaw. 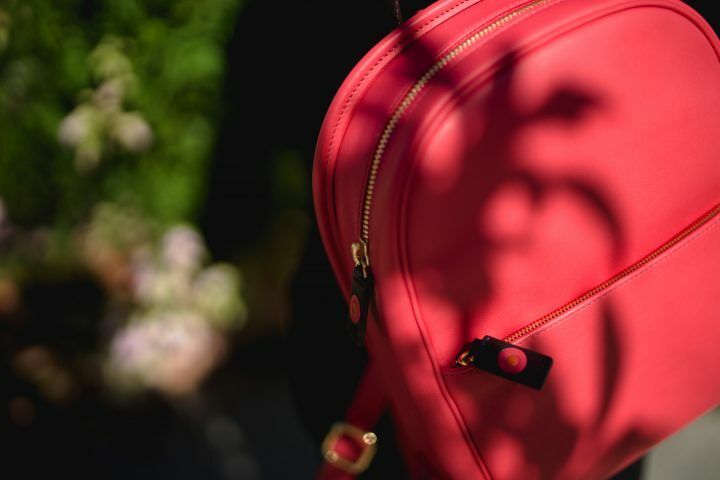 Aesthetically speaking, a bag will sit correctly when all of the parts are perfectly assembled. To achieve this, years of qualified experience are needed. No debe haber hilos sueltos. Desgraciadamente es algo que nos hemos acostumbrado a ver en artículos de mucha tirada. Desde BenchBags, para controlar éste junto a otros defectos, tenemos controles de calidad estrictos. El equilibrio estético se consigue con un correcto montaje de las piezas, trabajo que nuestros artesanos hacen la mayor parte de las veces “a ojo”, ese ojo que ha curtido la experiencia para que todo salga parejo. 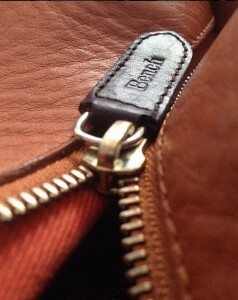 Last but not least is the zipper. It should have individually polished teeth and slide smoothly. Por último pero no por ello menos importante, está el detalle de la cremallera, ésta debe ser de diente pulido y debe deslizarse suavemente. We hope these tips will be useful the next time you decide to purchase a leather article. If you want to stay tuned, just subscribe and enjoy our latest news! Espero que esta pequeña guía os haya gustado y os sirva de ayuda en el futuro. Si no os queréis perder nada de nuestro blog, no dudéis en suscribiros!!! Prometo no inundaros la bandeja de entrada con cosas nada interesantes!!! ¡Un abrazo y nos vemos la semana que viene! Hello! We appreciate so much your interest. As you can tell, we´re starting off with this new project, our blog, and we´re puting a lot of efford and love in it, but at the moment we have to put our ideas in order about what we really want to talk about. Once more, thanks for your kind words and your interest in our contents.